Product prices and availability are accurate as of 2019-03-09 16:25:53 EST and are subject to change. Any price and availability information displayed on http://www.amazon.com/ at the time of purchase will apply to the purchase of this product. The product is 100PK 8" WHT Cable Tie. Easy and simple use kit. The product is manufactured in China.. Elegant design and finish. 8 inch standard Cable Ties, Bag of 100. Made from durable 6/6 Nylon material and has patented DoubleLock¿ design lends to its 75lb tensile strength which is 50% greater than industry standards. Maximum Bundle Diameter is 2 inches. 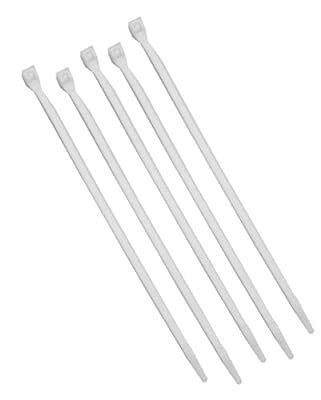 Cable ties are great for bundling wire, cable, hoses, ducts and countless other applications. Use around the shop, garage, home, office, etc.